We are delighted to announce that prints of a selection of the paintings by the recently discovered local artist, Carl Lawson, are now available to view and order exclusively through the [mine] gallery. A truly unique story surrounds our two previous exhibitions of 80 selected paintings by Carl G Lawson, a reclusive and previously unknown painter from Sutton, who studied at Camberwell School of Art in the 1960's under such luminaries as Frank Auerbach, Leon Kossoff, Adrian Heath, Euan Uglow, Patrick Procktor and Ron Kitaj. The generally large, experimental and dynamic paintings appear to have been produced over a period of about 30 years and were discovered, boarded up in the family home in Beddington in Sutton, which Carl abandoned in the 1980s to go and live in a commune in north London. 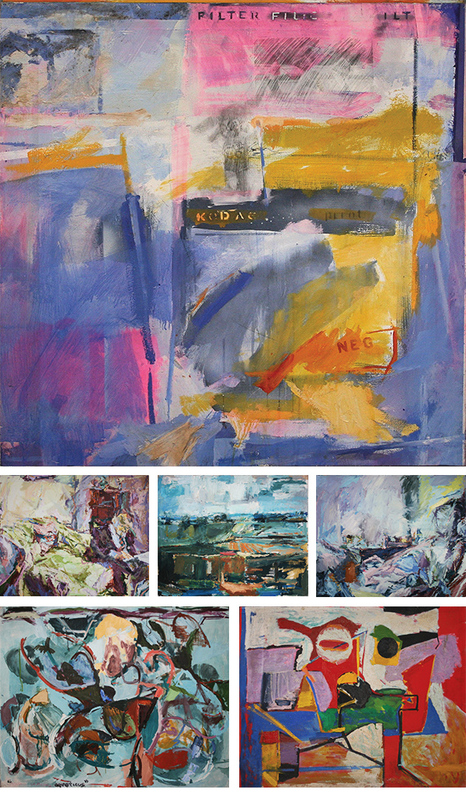 In addition to the influence of his tutors at Camberwell, Carl's paintings also show a keen interest in the work and ideas of David Bomberg, members of the Borough Group and Borough Botegga as well as the early American Modernist artist John Marin and Abstract Expressionist artists Willem De Kooning, Hans Hofmann and Philip Guston. Typographic stencils on two of the paintings make cultural and geographic references to an island in the Netherland Caribbean and to The Yage Letters, a collection of correspondence and other writings first published in 1963 by Beat Generation authors William S. Burroughs and Allen Ginsberg, which chronicle Burroughs' visit to the Amazon rainforest in search of yage (ayahuasca), a plant with near-mythical hallucinogenic and some say telepathic qualities. Research into Carl's paintings and story so far provides an extremely intriguing, engaging and personal account of a dynamic period in art and social history.